Family Air in Ketchikan, Alaska offers spectacular flightseeing, fishing, bear viewing, lake trips, and air charters in Southeast Alaska. We hope to make your visit with us here in Ketchikan, Alaska one that will stay with you for a lifetime. Whether it’s some of the best fly fishing in Southeast Alaska, breathtaking views of the Misty Fjords National Monument, or Bear Viewing at Anan Creek, Family Air would love to take you there. Fly with Us, Fly like Family. All our tours are flown in a Cessna 185 on Aerocet Floats, maintained to the highest standards that surpassed FAA Guidelines. Every seat is a window seat, so there is equally stunning views from all sides. Our noise reduction headsets and intercom system enable you to clearly hear and talk with the pilot througout the flight. Our plane comfortably holds up to (4) passengers. We look forward to flying with you! "The two trips we had with you (to Misty Fjords and to Waterfall Resort) were among the most memorable experiences of my 56 years. Your friendliness, humor, and obvious competence were noted and much appreciated. I hope to bring my wife there next summer, and you may be sure that we'll book with you.” - L.M. “Dave took us out today for incredible day fishing in a remote lake. So much fun Couldn't have asked for a better guide, pilot, and friend. Thanks for making our day great.” - Joe O. “BY FAR the best experience my family has ever had! If you have a chance to do this, YOU WILL NOT WANT TO MISS THIS!!!!!!!!!!!! !” - Melissa A.  “Our first time ever in a float plane and Family Air Tours was excellent! It was the highlight of our trip to Ketchikan. David was an awesome pilot and shared a lot of good info about the area during our ride. It was a pleasure to fly with you!” - Nicole N.
“We had an amazing time with Dave both fishing and flight seeing! Great guide, fisherman and very patient teacher. Was the highlight of Ketchikan! Plus we caught lots and lots of fish!” - Chris O. “This family of 4 thoroughly enjoyed our first off-the-boat excursion with Family Air Tours. Kendra picked us up at the dock, took us to the shop, suited us up and took us to Dave. We loved the flight and fly-fishing experience. Everyone caught fish and our youngest (11 y/o) caught 6! Dave was great with our girls (13 & 11) and mom who was beyond rusty with a fly-rod. Next time we're back in Ketchikan, we're booking another fishing trip with Family Air Tours.” - Steph L.